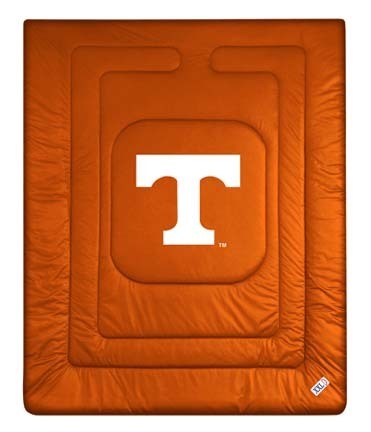 Wow your guests with this NCAA Medallion Door Mat by FANMATS. Adorned with your favorite team's logo, these door mats make a statement while keeping dirt and mud from entering your home. Heavy duty vinyl construction ensures a durable mat while a deep reservoir collects water and debris and rugged ribs scrape shoes clean. The West Virginia Mountaineers logo is molded in 3D construction. 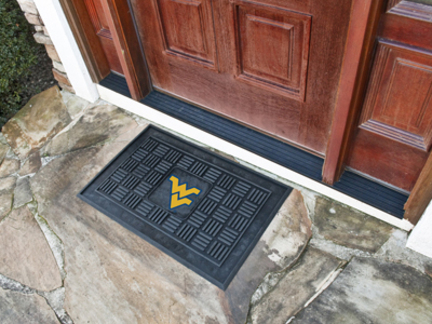 You found West Virginia Mountaineers 19" x 30" Medallion Door Mat in category Football and subcategory NCAA FanShop. If you need to buy more NCAA FanShop than you are on the righ place. FANMATS is a leading manufacturer of tufted floor mats and rugs specializing in officially licensed mat products. Each FANMATS product is produced in their 250,000-square-foot state-of-the-art manufacturing facility in Suwanee, Georgia, using high luster nylon yarn in 16 oz. face weight carpet.The mats are chromo jet printed, allowing for unique, full penetration of the color down the entire tuft of yarn. FANMATS products feature non-skid Duragon latex backing and a sewn serged edge. 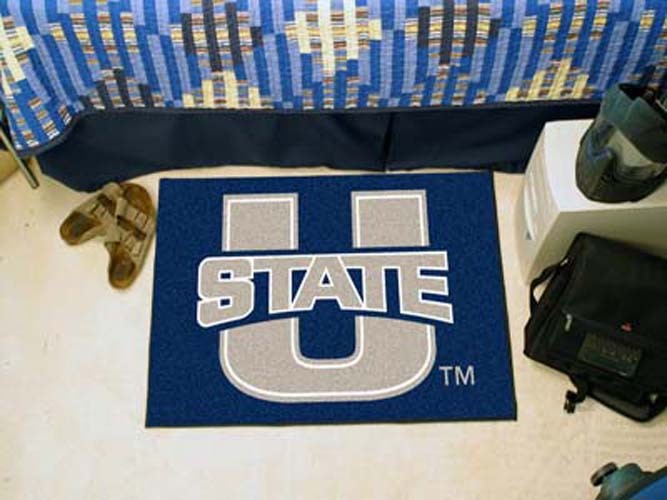 The result is a superior quality, highly attractive mat in vibrant true team colors that any NCAA Utah State Aggies fan would want to own. 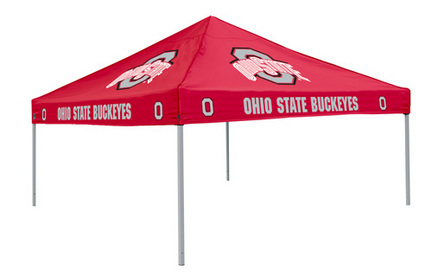 Large 9' x 9' frame with canopy Approximately 6 ft clearance to canopy bottom Stands 9 ft at tallest pointDurable water resistant canopy made of 200 denier polyesterOhio State Buckeyes School name and logo printed on all 4 sides Retracts to only 4 ft for easy moving and storage Heavy duty frame built with .7 mm powder coated steel and bolted jointsIncludes ground stakes for extra stability and tough nylon carrying caseSet up easy enough for two people NOTE: Logos are subject to change without notice. If you are in need of a specific logo, call our Customer Service department for further assistance at 800-856-2638. 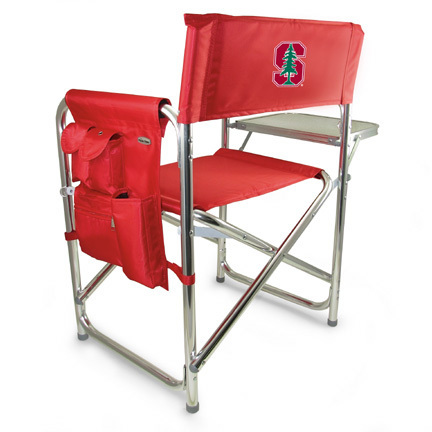 The NCAA Stanford Cardinal Sports Chair by Picnic Time is the ultimate spectator chair! It's a lightweight, portable folding chair with a sturdy aluminum frame that has an adjustable shoulder strap for easy carrying. If you prefer not to use the shoulder strap, the chair also has two sturdy webbing handles that come into view when the chair is folded. The extra-wide seat (19.5") is made of durable 600D polyester with padding for extra comfort. The armrests are also padded for optimal comfort. On the side of the chair is a two-toned 600D polyester accessories panel that includes a variety of pockets to hold such items as your cell phone, sunglasses, magazines, or a scorekeeper's pad. It also includes an insulated bottled beverage pouch and a zippered security pocket to keep valuables out of plain view. A convenient side table folds out to hold food or drinks (up to 10 lbs.). Maximum weight capacity is 300 lbs. The Sports Chair makes a perfect gift for those who enjoy spectator sports, RVing, and camping.